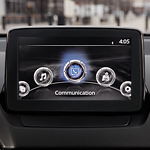 Toyota vehicles have advanced digital technology that meets the highest demands for connectivity and entertainment. Most new models are available with the signature Entune platform, which comes with touch screens in several sizes. 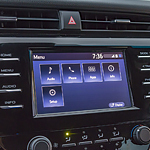 Riverhead Toyota invites customers to check out the latest infotainment systems that run on this exclusive software. The Entune hub is compatible with the latest virtual assistants, such as Amazon Alexa, Siri Eyes Free and Google Assistant. Such personalized concierge services deliver reliable information on just about anything. Long stretches of highway are no match for the new Toyota Tacoma. 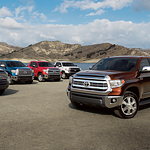 This popular mid-sized pickup truck is available at Riverhead Toyota. You can get it with the Dynamic Radar Cruise Control System, which is designed to adapt to changing traffic conditions. Are you in the market for a new compact car? At Riverhead Toyota, many of our consumers prefer the Toyota Corolla because it comes with a number of advanced features. These include exterior features that provides you with superior styling. Let's check out a few of its exterior features below. When it comes to customer loyalty and a tradition of excellence, the Toyota Certified Pre-Owned program has been at the top of the list since it was founded more than two decades ago. Find out some of the benefits of buying your next car through the Toyota Certified Pre-Owned below. There is a subcompact SUV that can keep you safe on the streets of Riverhead and that can help you stay safe as you head out on the highway. If you are looking for a popular vehicle that will look out for you if you are involved in a crash, consider the Toyota C-HR. We here at Riverhead Toyota are very excited to introduce you to the new Toyota Yaris. This popular subcompact car is beautifully designed. It has athletic exterior features that are sure to attract attention wherever you go. You can get a new Yaris with premium alloy wheels. 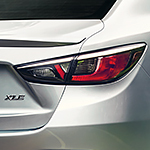 They come standard on LE and XLE trim levels. The 16-inch wheels feature a modern split-spoke design. 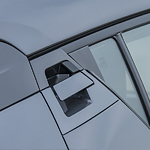 Instead of leaving the alloy material unfinished, Toyota treated the material to produce an attractive gunmetal color. The beautiful design and color of these wheels complement any available exterior paint finish. 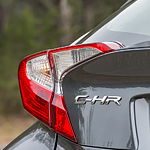 Taking a look at the all new Toyota C-HR exterior is sure to provide at least a few pleasant surprises. 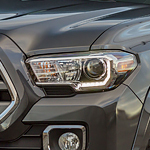 For example, most did not expect that they would find LED fog lights that can pierce through even the most dense of fogs. That is important to people who live in certain climates in which the fog is very likely to be a factor in how they go about their day-to-day life. 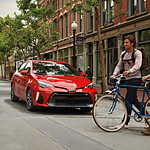 The Toyota Yaris, a popular subcompact, keeps with Toyota’s tradition of offering fuel-efficient vehicles that may be small but can keep up with larger vehicles in terms of performance, style and technology. Speaking of technology, there’s very little the Yaris doesn’t offer. Let us at Riverhead Toyota demonstrate this car’s features for you.